History: ASL purchased these as installation demo fixtures. The Pearls have received very little use and are in perfect working order. Just the right color of white light—for the eye or the camera. ETC introduces the Pearl™ luminaire as the newest member of the Selador Series® LED line. Pearl takes advantage of the best traits of the newest white LED offerings. Combining simplicity of use and the powerful output of white LEDs, Pearl provides a bright white light for studio and stage. 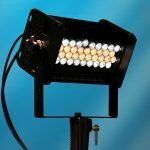 Pearl provides a carefully chosen mix of warm white (3200K) and cool white (5600K) LEDs that can be variably adjusted to provide just the right color temperature of white light—for the eye or the camera. Pearl’s extremely flexible lens system gives the user incredible control over the field size—from a narrow, soft-edge 17° spot—to an extremely wide 80° field of light. Pearl produces 3460 lumens from less than 125 watts of power, so the power at your video location goes a whole lot further.